employee shifts eyes from left to right then looking at the camera. 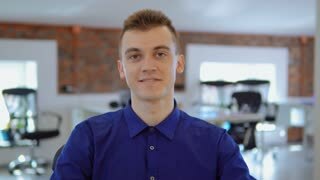 portrait young caucasian man wearing casual blue shirt sitting at the workplace in modern office. cheerful employee laughing looking at the camera front view. portrait young caucasian wearing casual blue shirt man sitting at the workplace in modern office.